A new online platform to assist African LGBTIQ asylum seekers in the many challenges of securing refuge in South Africa has been launched. Homosexuality is criminalised in more than 30 countries in Africa. South Africa is the only nation on the continent to offer marriage equality and constitutional protection from discrimination. It’s little wonder then that many queer Africans come to the country in an often desperate bid to escape state, social and familial persecution because of their sexuality or gender identity. South African law, under the Refugees Act 130 of 1998, allows LGBTIQ refugees under threat to apply for asylum. But when they arrive, they are faced with an unfriendly, impenetrable and often homophobic bureaucratic system that seems intent on making it difficult for them to stay. Created by the Gateway Health Institute, WoZa Life aims to make these individuals’ lives a little easier by providing them with information and resources to navigate their way through the complex asylum seeking process. 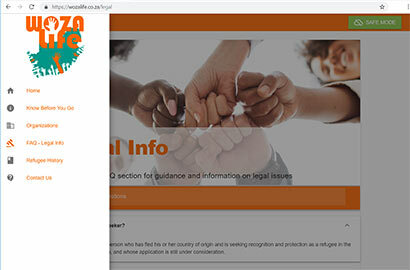 The WoZa Life site provides links to useful organisations, information on what to expect before arriving in South Africa, and a comprehensive FAQ that outlines asylum seekers’ rights and the intricacies of the asylum system. The site is said to be safe and secure to use and includes a “safe mode” button at the top of the page that allows a user to instantly turn the page blank. The Gateway Health Institute has been working with African LGBTIQ asylum seekers and refugees since 2017, offering direct assistance in the form of safe accommodation, legal assistance, access to healthcare and basic necessities. “Through our interactions with these individuals we quickly learned that a large number of refugees are ill informed and equipped when arriving in South Africa,” says Coenie Louw, Founder and Director: Health & Nutrition at Gateway Health Institute. “They struggle to navigate the asylum process, find it hard to access legal assistance to deal with bureaucratic red tape and corruption at the Department of Home Affairs, or where to go to seek assistance and support when needed. “Our main concern is that LGBTIQ often end up unemployed and homeless, increasing their risk of acquiring HIV or not being able to access ARVs, PrEP, counseling and other vital health services,” says Louw. He also acknowledges that discrimination is a reality for LGBTIQ asylum seekers when dealing with Home Affairs, where they are vulnerable to victimisation by homophobic officials. According to Louw, there is a backlog of around 600 000 asylum cases at Home Affairs, but there are very few statistics for how many are LGBTIQ refugees as reporting does not separate data for LGBTIQ from the general refugee population. To access the WoZa Life platform, click here.